Several years ago, a change of environment inspired a change of career. 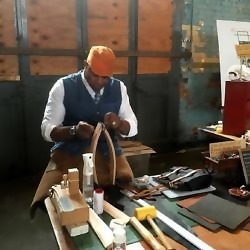 A move from London to the foothills of the Pennines re-kindled a passion to create and make, using the material that so many of his well-worn and well-used accessories were made from - Leather. On his journey Jason has learnt, and is still learning, from some great leatherworkers who share the same ethos of using traditional methods and high quality leathers. In his Saddleworth workshop he stays true to his original ethos of making all leather goods by hand, with hand-stitching at the core. Whilst adding a functional benefit of strength, he talks passionately about the calming and repetitive nature of stitching and creating something both beautiful and strong from something as simple as a stitch His own products under JS-Y LEATHERWORKS combine function and durability and each item is used during the development process, to understand how the leather behaves and to just see if it feels right. If it doesn’t, it gets reworked until it does. He only uses high quality leathers and fixings, which source and select himself. It’s safe to say he has seen every hide in person, which has also helped build some great relationships with UK sources along the way. The natural beauty of the leathers used ensure each item is individual and over time the leathers will take on unique characteristics of age and wear. He also shares his passion for leatherwork through my teaching, under Diamond Awl. Students come along to the workshop and choose to make either a small leather good or a bag, over one or two days – learning the same skills and methods he practices.